A radio host and DJ is assigned to report to Vietnam to do a show for the Armed Forces Radio Service, a station which plays out the stereos of the troops stationed in the country. His name is Adrian Cronauer and he has a knack for following his own rules, not the constrained demands of his uptight supervisors who are insecure about their titles and not being saluted enough. In the midst of conflict in the country, Cronauer's show of comedy and modern music is a refuge during the soldier's day. Unfortunately, not everyone is so happy to see him succeed and things escalate off the air. This is not a typical war movie. It is a light-hearted comedy on the surface, rooted in a lot of darker themes with the ongoing war. One of these is censorship, which the character of Cronauer fights against with his humor and defiance of authority. 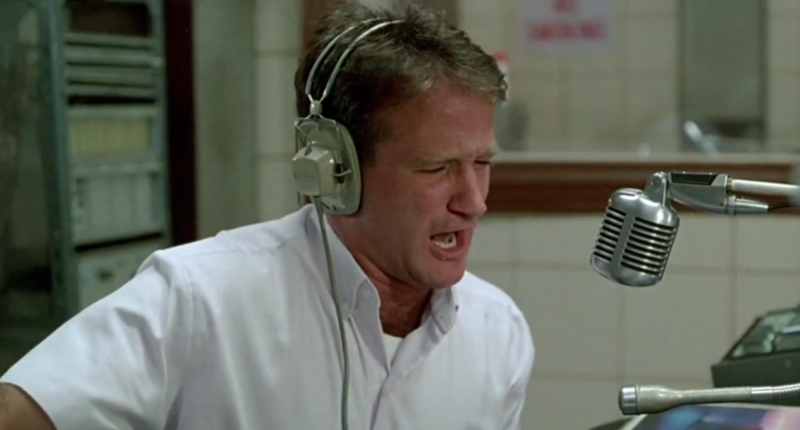 What better an actor to play him than Robin Williams, who gives one of the finest performances of his career (R.I.P). His on-air broadcasts are a hilarious array of ad-libbed anecdotes, which are still nowhere to even be seen in radio today. And to do so on an Army station is even more bold, especially at the time this takes place. The mix of humor with serious issues presents a well-balanced story. Forest Whitaker also does a terrific job acting alongside Williams throughout the layered narrative.